In this article, we will look at the different reasons why emails go missing and what you can do to restore them. You noticed a large chunk of emails missing from your inbox. Have you recently checked your email using POP3 on another computer or mobile device? If so, you might have accidentally downloaded the emails to that device, removing them from the server. While both POP3 and IMAP are protocols used to handle incoming emails, but they differ in the way your incoming emails are handled and synchronized. POP3 works by downloading the entire contents of your inbox to your computer. 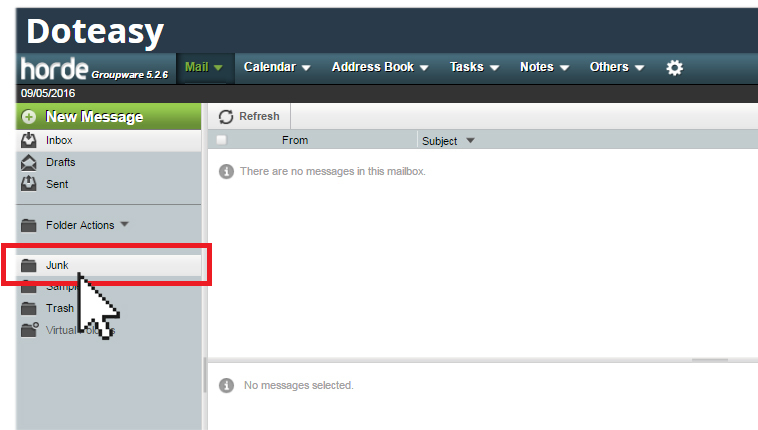 In the typical POP3 setup, emails will be removed from the mail server once it is downloaded onto your computer or device. When you check your emails from another computer or device, this can make it look like all the email has disappeared. On the other hand, with IMAP you are connecting to your mail server with your email client. When doing so, you are managing the emails directly on the mail server – no emails are downloaded to your mail client or device. Because of this, IMAP makes it possible to access your emails from different devices and all changes are made at the mail server level. While Doteasy offers both POP3 and IMAP, we recommend using IMAP as it gives you the flexibility to manage your emails from multiple devices or email clients and at the same time, providing peace of mind that if anything should go wrong with your device, you can still access your emails from your mail server using another device. Your missing emails might have been labeled “Junk”. If you have followed the steps above but you are still experiencing missing emails, please contact us so we can help you further investigate and rectify the problem.